Home > ACCESSORIES > Jack-O-Lantern Candle Holder 9"
Polish Pottery Jack-O-Lantern Candle Holder - this unique Polish Pottery piece is Halloween Season's favorite! Make your fall decor shine with this handmade and hand painted 9" Jack-O-Lantern Candle Holder. Use a small candle for a safe and easy way to light your pumpkin. 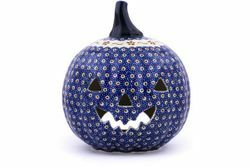 Polish Pottery Handmade Jack-O-Lantern Candle Holder makes a beautiful presentation and a practical gift. $81.95 Jack-O-Lantern Candle Holder 9"